Vivid spacial diary. One day a page (Sunday separate) with Tamil Panchangal information pages & Mythological pictures bound with art paper hard board finishing with UV coating. Vivid spacial diary. One day a page (Sunday separate) with Tamil Panchangal information pages & Mythological pictures bound with art paper hard board finishing with UV coating. 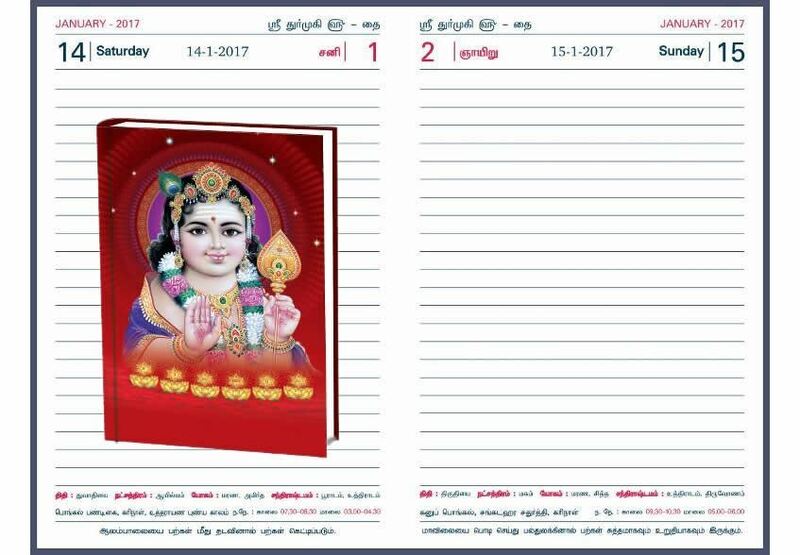 One day a page (Sat Sun clubbed) with Tamil Panchangal information pages & Mythological pictures bound with art paper hard board finishing. Vivid spacial diary. One day a page (Sunday separate) with Tamil Panchangal information pages & Mythological pictures bound with art paper hard board finishing with UV coating. One day a page (Sat & Sun Clubbed) with paper coated PVC hard board finishing. Vivid spacial diary. One day a page (Sunday separate) with Tamil Panchangal information pages & Mythological pictures bound with art paper hard board finishing with UV coating. One day a page (Sat & Sun Clubbed) without Engineering information pages bound with art paper hard board finishing. Vivid spacial diary. One day a page (Sunday separate) with Tamil Panchangal information pages & Mythological pictures bound with art paper hard board finishing with UV coating. One day a page (Sunday separate) with Tamil Panchangal information pages & Mythological pictures bound with art paper hard board finishing with UV coating. Vivid spacial diary. One day a page (Sunday separate) with Tamil Panchangal information pages & Mythological pictures bound with art paper hard board finishing with UV coating. One day a page (Sunday separate) with Tamil Panchangal information pages & Mythological pictures bound with paper coated PVC hard board finishing. Vivid spacial diary. One day a page (Sunday separate) with Tamil Panchangal information pages & Mythological pictures bound with art paper hard board finishing with UV coating. One day a page (Sat Sun clubbed) bound with foil coated art paper hard board finishing. Vivid spacial diary. One day a page (Sunday separate) with Tamil Panchangal information pages & Mythological pictures bound with art paper hard board finishing with UV coating. One day a page (Sat Sun clubbed) bound with art paper hard board finishing with UV coating.